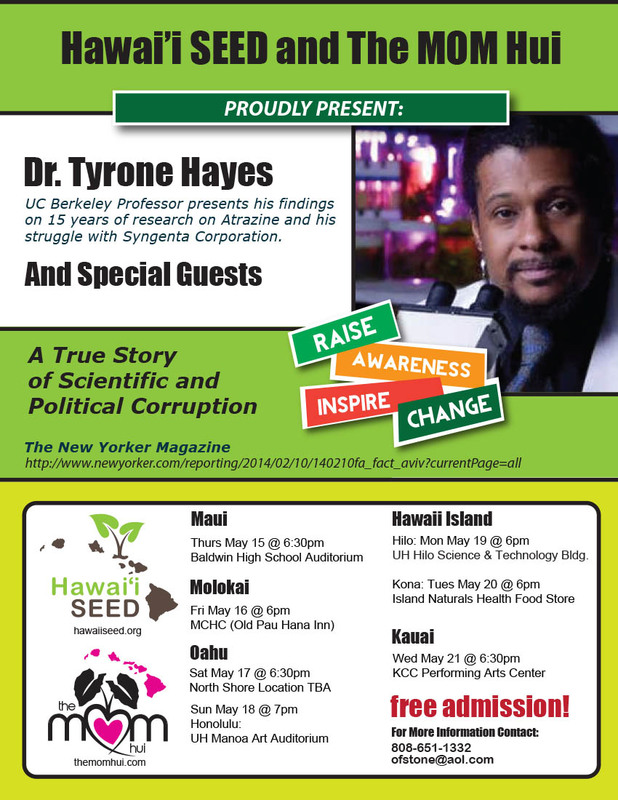 Hawai’i SEED today announced the state-wide speaking tour of world-renowned University of California Berkeley Professor of Integrative Biology Dr. Tyrone Hayes. Dr. Hayes will be joined by local food advocates from each island community. Paul Towers from Pesticide Action Network will be speaking as well, presenting an overview of pesticide use nationally and internationally and the significant role that Hawaii plays as ground zero for open-air pesticide experimentation. Dr. Hayes is best known for his research findings that Swiss Chemical Company Syngenta’s herbicide atrazine is an endocrine disruptor that not only demasculinizes male frogs but transforms them into fully functioning reproductive females. Dr. Hayes is also an advocate for critical review and regulation of pesticides and other chemicals that may cause adverse health effects. Dr. Hayes has presented hundreds of papers, talks, and seminars on the role of environmental chemical contaminants in global amphibian declines and in the health disparities that occur in minority and low-income populations. According to Joy Shih, a doctoral candidate at the University of Hawaii’s School of Ocean and Earth Science and Technology, “The chemical poses a particular threat in Hawaii because of the islands’ geography.” She thinks atrazine should be banned. “I think of Hawaii as one giant watershed,” she said. “There is no inland, from the tops of the mountains, everything flows into the ocean. So anything that you apply that is water soluble ends up in the ocean. Fish are definitely affected and coral is affected.” Shih said that studies show that atrazine causes coral bleaching and harms phytoplankton, which rest at the bottom of the aquatic food chain. aquatic life for decades, but the herbicide is regularly used for corn production as well. “Atrazine in Hawaii” Civil Beat. March 11, 2013.
pursued him”. The New Yorker. February 7, 2014. “It’s Been Crazy:” Berkeley Biologist Feels Vindicated by Reaction to New Yorker Profile. California Magazine. February 25, 2014.